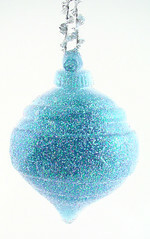 Here’s a different take on Holiday decor – soapy ornaments that smell delicious. For Christmas this year, I made ornaments from soap that smell as festive as they look. Decorate your tree or give as unique holiday gifts. Today I will show you the basic technique for an-all over glittery soap. Tomorrow, I’ll show how you can make your own soap paint and add detailed decorations to your soap. Step 1: Melt the M&P base and add color and fragrance (if this is your first time making melt & pour soap check out this tutorial for more detail). Step 2: Cut about a 6 inch length of ribbon. Pour the melted base in the mold and place the ends of your ribbon at the top of the mold. You might have to hold it in place until the soap thickens or use a little piece of tape. Step 3: Once the soap has fully set-up, remove them from the mold. Go on to step 4 if you want a quick and easy glittery ornament or check out our soap paint tutorial tomorrow for a fancy finish! Step 4: Spritz the soap with hairspray. Step 5: Sprinkle glitter onto the soap. We used a plastic bowl to catch the excess glitter to easily re-use it. It’s important to use glitter approved for cosmetic use so that it doesn’t scratch the skin or cause an allergic reaction. Step 6: Spritz with another coat of hairspray to hold the glitter in place and you’re done! 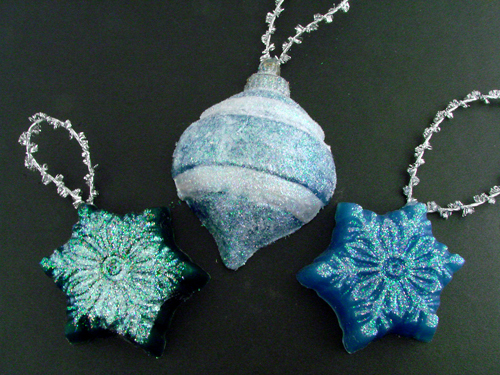 Check back on Friday for a Soap Painting Tutorial to make your ornaments look even more festive. Thanks for the good wishes! I’m so excited that some of you are going to try this project. Cindy, the ribbon is a glittery raffia type ribbon that I got at Jo Ann’s Fabrics. Teresa, yes, that’s the glorious part of this. You can use these as regular soaps when it’s all done being holiday-time. I’m assuming you can use these as regular soaps after you’re done decorating with them (despite the hair spray)? They look beautiful! O M Gosh! Darling!! However; did you spray glitter on the ribbon too? Or is that some type of garland in your photo? Oooh I love them. What perfect gifts. I think I will try to make some for people at work. o these are too cute! beautiful AND useful, what’s not to love? What a unique idea, they have a dual purpose, decorating and soap. wow these are great, I love the sparkle! P.S. – Congrats on the Martha Stewart feature!